Pumpkin Cookies Recipe For Halloween Is Spooktacular! 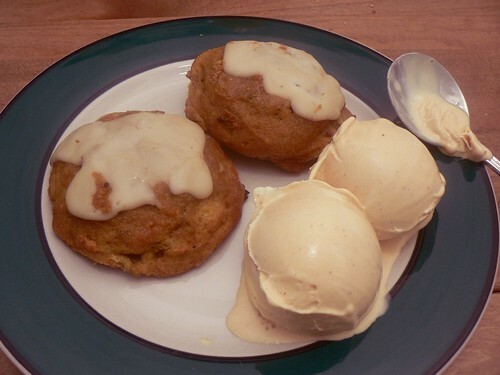 This recipe for pumpkin cookies is simple and delicious! They are a spongy texture with a yummy cream cheese icing. Be sure you make plenty as they are sure to disappear fast once the little goblins sink their teeth into them. Trust me when I say that there won’t be a crumb left on the plate. Mix flour, baking powder, baking soda, salt and spices together in large mixing bowl with wire whisk. In your stand mixer bowl place the 2 eggs at room temperature along with light brown sugar. Mix until mixture is smooth and lighter in color. Add oil, pure vanilla extract and pumpkin puree. Beat together until well mixed. Beat the dry ingredients together with the wet mixture. Using your ice cream scoop, place batter on your baking sheet. Space about 2 inches apart. These are big cookies with a cake-like consistency. Bake approximately 15 to 18 minutes or until an inserted toothpick comes out clean. Kind of like baking a cake. Cool completely before frosting them. Using your stand mixer with the paddle attachment (or stand mixer if you prefer), mix together cream cheese and butter. Beat together until creamy and smooth. Sift powdered sugar through strainer over the top of the cream cheese mixture. Add 1/2 tsp. of pure vanilla extract. Beat together until smooth. Start slowly and bring up the speed or you will look like a ghost from flying powdered sugar. Scrape down the sides of the mixing bowl occasionally. If your icing is too thick, add a little milk. If it is too thin, add a little more powdered sugar. You can spread the icing on your cookies, or pipe it on. The choice is yours. Just snip a small corner off your zip-lock bag or piping bag. This pumpkin cookies recipe is sure to become an annual Halloween favorite around your house! I do hope you enjoy this delicious melt-in-your-mouth cookie recipe as much as I do. I particularly love them with a steaming cup of coffee! This recipe is excellent! Very easy to make too. Of course I could eat and breathe pumpkin if given half a chance! I agree with you completely, Dennis. I am addicted to pumpkin myself. What is great is that there are so many things we can make with it. Pumpkin is good for us too!